Many of the official events which are staged by the City of Sydney in Sydney Town Hall add colour to city life but few people understand their significance. Many civic traditions associated with local government are based on medieval customs which had their origins in England during the Middle Ages. During that time, towns grew as trade expanded and a new merchant class became powerful. The king, rather than individual noblemen, now controlled the governance of towns. Merchant guilds regulated trade and business practices, often clashing with the craft guilds which regulated the working hours and conditions of their members. Heraldic symbols were used from the 12th century as a means of visual identification on shields and banners of medieval knights, and on their clothing hence the term ‘coat of arms’. By the 15th century, coats of arms had been adopted as identity and decoration for individuals, organisations, corporations, and cities. 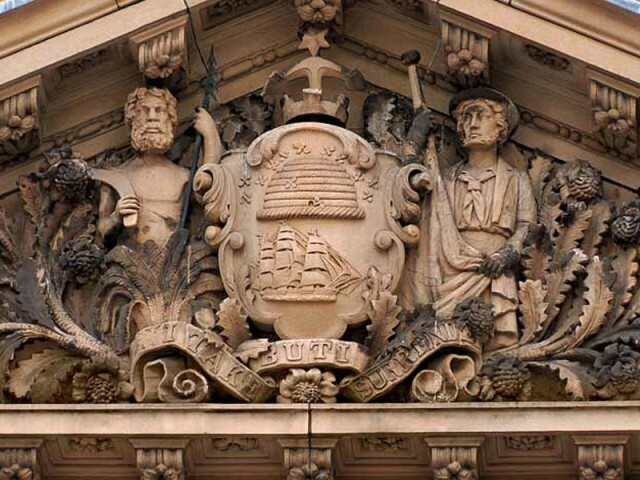 The City of Sydney’s coat of arms appears in many forms in Sydney Town Hall and was derived from a design drawn by a Council employee in the mid 19th century. The coat of arms used today is an adaptation of that, and uses the city badge (crown and anchor) with an entwined rope and serpent, combining symbols which represent the maritime heritage of the city and the traditional landowners, the Eora people. The City of Sydney flag was inspired by the design for a traditional medieval standard approved for use by England’s College of Arms in 1937. 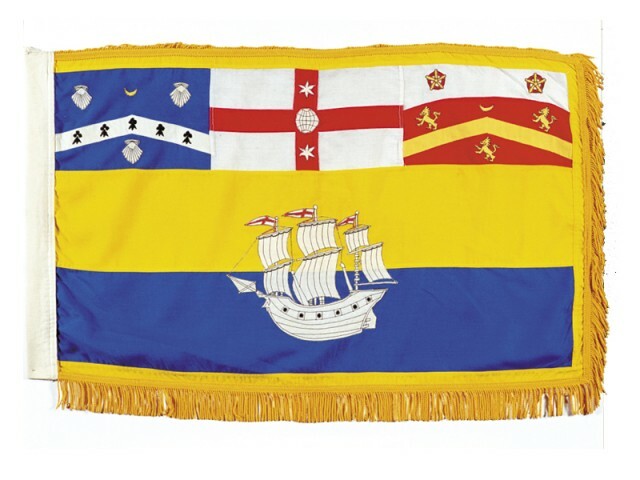 Designed by Sydney vexillographer, John Vaughan in 1989, it features a three-masted sailing ship on a blue and gold background and the coats of arms of Thomas Townhend, Viscount Sydney; the posthumous arms of Captain Cook and the coat of arms of Sydney’s first lord mayor, Sir Thomas Hughes. 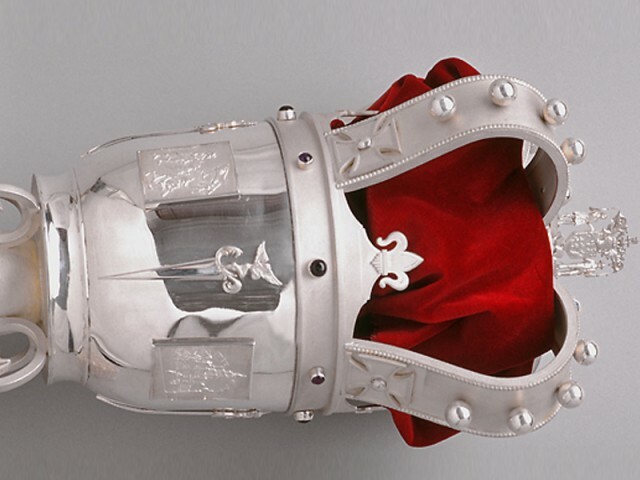 The mace, a stylised form of a prehistoric club, was intended to denote the royal authority of the king. Originally a weapon, it became a symbolic interpretation, often made of a precious metal, and usually incorporating a crown in its design. 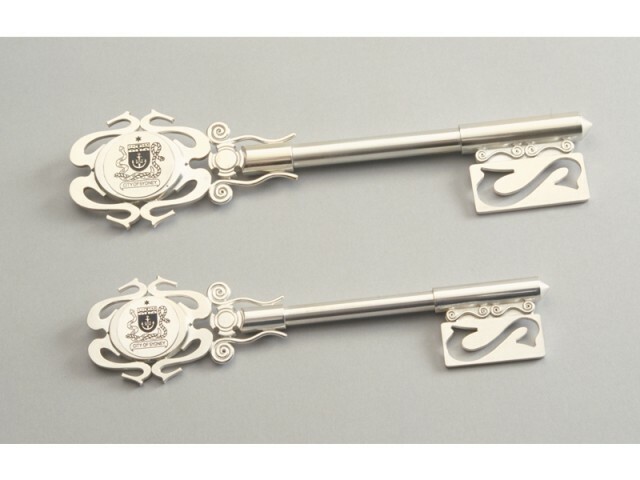 In some cities, maces are carried as part of a formal procession, ahead of the mayor or lord mayor, suggesting that no-one should come between the king and the mayor. Although the City of Sydney does not uphold this tradition, it has a ceremonial mace which was specially commissioned for Council’s sesquicentenary in 1992 by the Friends of Sydney Town Hall. Civic chains are thought to have been styled on collars worn by knights during the Crusades and generally consist of a series of links joined together, often inscribed with the names of aldermen or councillors, and a large medallion decorated with the coat of arms of the town, municipality or shire. 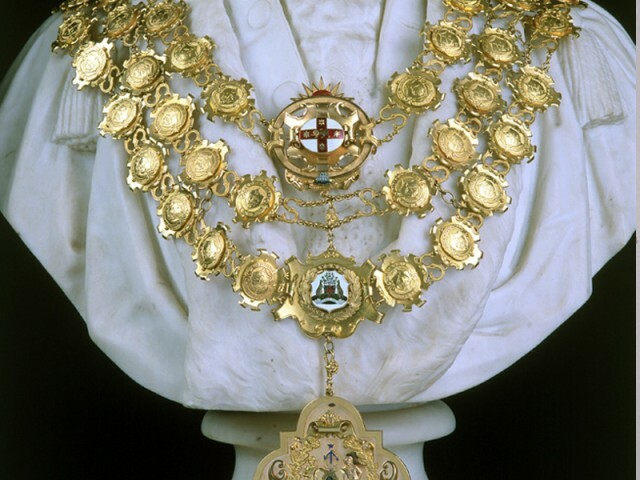 The chain of office is generally worn at civic functions, citizenship ceremonies and official functions as a symbol of the authority of the mayor or lord mayor. In days when cities were enclosed within fortressed walls and entry was restricted, the custom of unlocking gates to admit those approved to enter, evolved. Today the key to the city is a symbolic award presented to individuals or organisations in recognition for an outstanding contribution. The City of Sydney awards the key to the city as the highest honour it can bestow. Freedom of Entry confers the right, title, privilege, honour and distinction of marching through the streets of the city on special occasions with ’bayonets fixed, drums beating, bands playing and colours flying’. In Sydney, this honour is restricted to military and civilian units with a special association with the city through their service international peace and to the community here and overseas. This tradition seems to have originated in medieval times when any body of armed men wanting access inside the fortifications of a city would be challenged at the gates for the right to enter. Sydney has a town crier who upholds the medieval tradition of ringing a hand bell to summon citizens and deliver civic greetings and proclamations at official events in the City of Sydney. It was the job of the town crier in medieval times to ring his hand bell to warn residents of fire or attack, deliver news, make announcements or call people to meetings or court. Current town crier, Graham Keating has been widely recognised for his work, earning world and international championships. The City of Sydney stages civic receptions and welcome home parades for military units, civilian groups and sporting teams which have made a special contribution to city life. These parades pass the front steps of Sydney Town Hall where the lord mayor acknowledges their presence from a ceremonial dias. This public recognition is important in engendering a strong sense of community in the city.